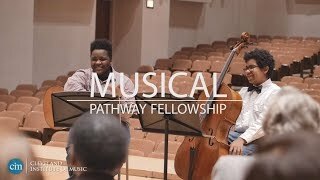 Designed for African-American and Latinx students interested in a music career, the Musical Pathway Fellowship (MPF) Program—sponsored by the Cleveland Foundation and George Gund Foundation—provides exceptional artistic training delivered by CIM faculty. One-on-one lessons, ensemble experience and participation as well as training in music theory and eurhythmics are offered. The MPF program will provide ongoing, multi-year support to students, including comprehensive music instruction through high school, with a goal of preparing them to enter a conservatory or university music program upon graduation. Fellows will receive a full scholarship covering all areas of study in the program. MPF students and families will also receive ongoing support to develop the musical talents of participating students through workshops, master classes and mentorship. Vocalists or students who play orchestral instruments, piano or guitar who are entering grades 5-10 are eligible to apply. Students must submit an application with signatures from their teacher and parent or guardian. Applications can be emailed to lisa.whitfield@cim.edu or mailed to the following address: Lisa Whitfield, Cleveland Institute of Music, 11021 East Blvd., Cleveland, OH 44106. For more information on the audition requirements, please view the application. MPF fellows are evaluated at the end of fall and spring semesters to assess growth, challenges and needs, and so faculty, staff and mentors can best help them succeed.